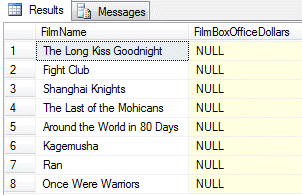 In SQL Server when a value has not been entered in a column for a particular record it is referred to as NULL. There is a unique syntax for writing criteria to find these null entries. You can spot nulls in a set of results quite easily! These films have no information in the FilmBoxOfficeDollars field. The above query finds all of the records which have a value in the FilmBoxOfficeDollars field. All of these records have some sort of value in the box office column. The query now finds nulls in the specified field. It's difficult to think of a good reason for changing the standard behaviour of nulls in criteria. In fact, according to the Microsoft website, future versions of SQL Server will no longer allow you to do this. That's everything on basic criteria in SQL queries. If you're interested in some advanced techniques involving the IN operator and want to learn about the ALL, SOME and ANY keywords, you might want to check out my blog on subqueries!